Ernie and Bert are the best of friends. Though both have different characters, they do get along very well. They have different hobbies. Bert collects paperclips, bottlecaps, loves pigeons. Ernie loves his rubber ducky. Bert is the quieter of the two and Ernie is the bubbly and noiser one. 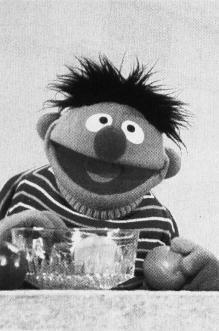 Ernie annoys Bert with his neverending questions especially when Bert is trying to sleep. 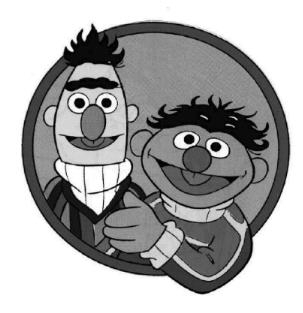 The two make a very good pair of bosom buddies and are my favourite characters in Sesame Street. Here are some of the funnier dialogues between them. Ernie and Bert showing off their new sweaters! Ernie showing Cookie Monster how to make different shaped and sized cookies. A close-up view of Ernie! A present from Ernie and Bert made Oscar smile! Such a rare one! Glad it was down in the picture. Back for more sweet memories!